For businesses, especially those operating heavily within E-commerce, what do truly sustainable solutions look like? From open lines of communication to central intelligence systems, as the pressure in the shipping and logistics departments mounts, retailers have more to focus on than just creating quality goods and services. Artificial intelligence is changing the game for sustainability in supply chains. In 2018 alone, eight out of ten customers were unlikely to shop again with a retailer after a poor delivery experience. Setting aside dissatisfaction of products, poor quality, or too high prices, consumer focus on fast and reliable delivery is quickly becoming a top priority. Between 2016 and 2017, E-commerce sales themselves grew by 16%, express shipping air freight volume grew by 9%, and US imports increased 5%. As a result, companies in the US are spending a total of $1.5 trillion on shipping and logistics, and yet, it still may not be enough. Amazon shipping options have undoubtedly raised the bar for both consumer expectations and E-commerce as a whole. Free two-day shipping, for its millions of customers, is well worth the yearly Prime subscription and keeps shoppers localized within Amazon’s marketplace. Yet, three in four consumers would choose another retailer over Amazon if that retailer offered better delivery options – no small feat. Perhaps more so than any other department, shipping and logistics come with plenty of unique complications and problematic inefficiencies. Too many inefficiencies and the consumer base is likely to notice. For late and unsatisfactory deliveries 90% of consumers expect a full refund; additionally, their expectations range from notifications, flexible delivery windows, and real-time tracking visibility. This can be tricky to manage for businesses, especially when juggling the existing inefficiencies of transportation of tools, equipment, and even people. Over 2018, empty trucks traveling accounted for 16% of total mileage used by just one US company and unscheduled vehicle or equipment repairs made up 65% of all maintenance costs. Businesses with huge logistical demands need better solutions than just traditional operations efficiency standards. Now that customer experience and satisfaction is tied so deeply in with shipping and delivery, new standards are required – and smart suppliers are looking to AI. A 2017 study among retailers revealed that 71% of those retailers surveyed found that sharing logistical data like shipment, order, and delivery data, among all departments, was an important step for their business. While AI steps into the service industry, its presence in the world of e-commerce is more symbiotic and stabilizing. With AI, retailers and manufacturers can have opportunities to aggregate data from all parts of operations, even past data, to help build better and longer lasting solutions. In more board terms, AI is able to predict market demand and shift to help recommend solutions for adjusting inventory and avoiding excess, passing efficiency on to the customer. When the success of a business hangs in the balance of consumer satisfaction, and consumer satisfaction lies within shipping and delivery quality, smart business leaders make proactive move to streamline operations. 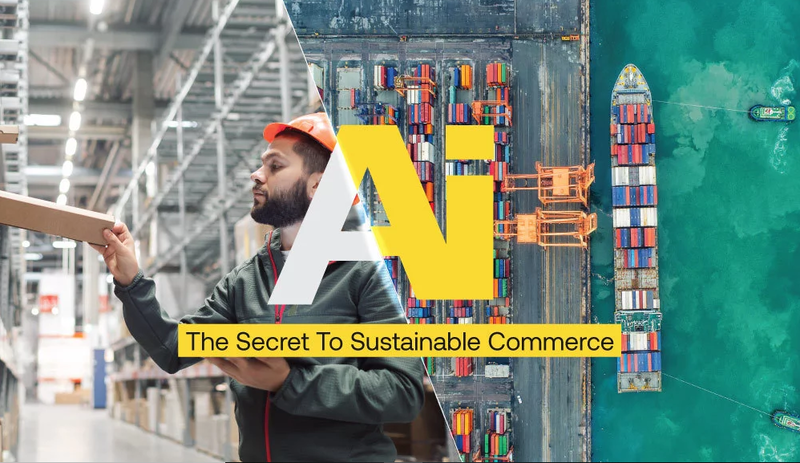 Learn more about how AI is making sustainability possible.